Next year, more Karuk traditional knowledge and practices will be taught to HSU students in the fields of science, technology, engineering and math (STEM), thanks to a grant from the National Center for Science and Civic Engagement (NCSCE). 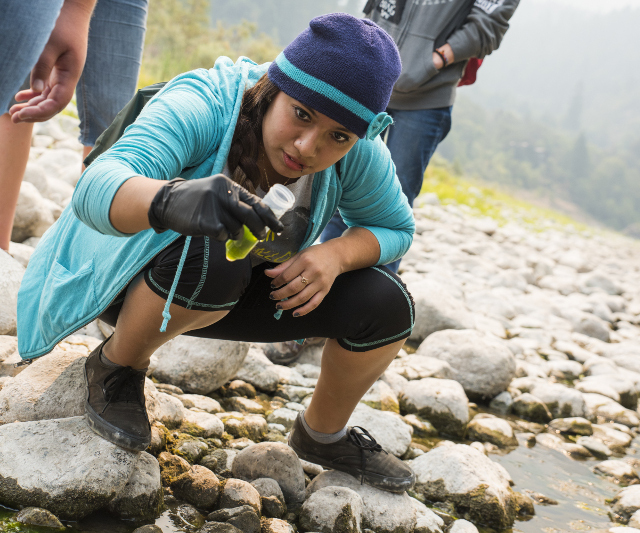 Klamath Connection students test water quality on the Klamath River. Announced in November, the grant will allow HSU faculty to partner with scientists and cultural practitioners from the Karuk Tribe Department of Natural Resources to develop curricula that allows both HSU students and local tribal youth to increase their understanding of the relationship between Western science, traditional ecological knowledge and many cultural and social issues of particular importance to the Karuk Tribe. The project is part of the NCSCE’s pilot Transcending Barriers to Success program, which aims to connect civic, sustainability, and cultural issues to STEM learning, increasing partnerships between Native people and local universities. HSU is one of only four sites in the nation to participate in this program. Biology Professor Amy Sprowles, Pikyav Field Institute Program Manager Lisa Hillman, and Karuk Tribe Director of Natural Resources and Environmental Policy Leaf Hillman received the grant, expanding on their collaborative work through the Klamath Connection, an immersive, place based program for first-year science students that centers around issues in the Klamath Basin. Sprowles says the grant will allow HSU to expand the scope of this kind of multi-disciplinary work in Klamath Connection, Stars to Rocks, Rising Tides, and other HSU place-based learning communities currently in development. The third piece of the program is to adapt these lessons for local tribal youth through the Pikyav Institute. HSU students will act as peer mentors for Native youth on projects at this new field institute in Orleans, learning from those students’ cultural experience as well. By explicitly demonstrating how science, technology, engineering, and math can be used to address environmental, social, and cultural issues of concern, Sprowles believes the Transcending Barriers to Success program will help students appreciate how their academic disciplines can promote sustainability and environmental justice. “Our ability to address complex social problems can only benefit by sharing knowledge and experiences across cultures. We hope this project will allow students from all backgrounds to appreciate that interdisciplinary study has the potential to profoundly expand the limits of disciplinary silos in addressing issues of common concern,” Sprowles says. The National Center for Science and Civic Engagement (NCSCE) at Stony Brook University has received a grant to establish and advance robust partnerships between indigenous peoples and local formal and informal educators to improve educational outcomes for all students, promote cultural understanding, and foster long-term collaborations on issues of common concern. Local environmental and health issues will provide context for inquiry-based learning that transcends perceived conflicts between indigenous, local, and “Western” knowledge systems. Cultural collaboration is not merely the awareness of traditions other than one’s own. It requires a deep understanding of and appreciation for the strengths that multiple perspectives bring to solving the complex, contested issues facing all communities. This includes recognizing the impact of past injustices and conflicts that indigenous people have experienced as well as a grounding in the cultural connections of relationships with the environment, traditions, and sacred spaces. Read more about the Klamath Connection here.